Services in your area are provided by a network of funded partners through a combination of federal, state, and local dollars. The goal of these programs are to help individuals age in the location of their choice using both family as well as agency service and support to avoid going to a long term care facility if possible. Consumers can contribute to the cost of the services they receive. Most of these programs are for adults age 60 and over regardless of ability or income. Not every county offers every service. Day Care Services for Adults supports an adults’ personal independence by promoting their social, physical and emotional well being. Generally in a group setting, an adult day care program offers a nutritious meal, activities and snacks. Medical examinations are required for individual participants for admission to a program and periodically thereafter. Adult Day Health Services provides healthcare services to a client in need of more hands on care. Services must be provided in a home or center certified to meet state standards for such programs. Seeks to reduce the stress of caregiving by providing respite, care management, and supplemental assistance. Read more about our Family Caregiver Support. Evidence-based classes on managing chronic illnesses such as arthritis, heart disease, and diabetes. Read more about our Health and Wellness programs. Home delivered meals provide a nutritious meal delivered right to the doorstop for people who are not able to get out of their homes without significant effort due to physical or mental limitations. This service provides minor home repairs and modifications, such as ramps and grab bars, to eligible individuals. Currently, Cabarrus County is the only county in the region that offers this service. The service system in N.C. is complicated and confusing for most people. Each county has established leaders who works with individuals on determining what their needs are, what service(s) can best assist them in meeting the need and what payment source can be used to connect the person with the service. There are two types of In-Home Aide Programs that help support individuals and prevent going to a long term care facility. Home Management: People who need help with home chores such as cooking laundry, light housekeeping, shopping might be able to receive “home management”. Personal Care Services: Personal care, which is more extensive and complex in nature, is provided by a certified nurse aide employed through a licensed home care agency. Services that are considered personal care in nature can include help with bathing, dressing, toileting, feeding, and ambulation. These services are in great demand so that some areas maintain a wait list. Priority is given to people who are at or below poverty, live in rural areas, or are at risk for elder abuse. Clients eligible for services must be 60 years of age or older, live at home, and have home management and/ or personal care needs. 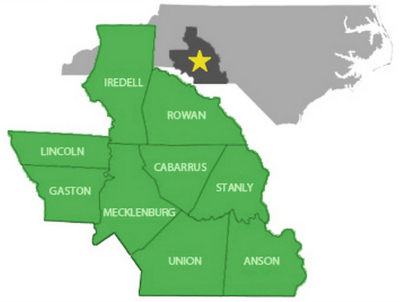 N.C. Legal Aide through the Senior Law Project serves Anson, Cabarrus, Gaston, Iredell, Lincoln, Rowan, Stanly and Union counties. Legal Services of the Southern Piedmont serves Mecklenburg County. Congregate nutrition provides a hot meal in a social setting. This “more than a meal“ model offers participants 1/3 of the daily recommended dietary allowance requirement for nutrition and is typically prepared by a food catering services. Congregate sites, which may include senior centers, churches and community centers, are available in all nine counties and sometimes transportation is available. Community focal points for social, emotional, health and financial support. Specially equipped vans/buses are used in Senior Transportation services. These vehicles provide trips to and/or from community resources such as the doctor’s office, dialysis centers, nutrition sites, or other locations for the purpose of accessing needed services or carrying out activities for daily living. Transportation Services are limited to individuals 60 years of age and older who are in need of the service. Contact your county to see what community based services are available.